Wild, mountainous and beautiful. 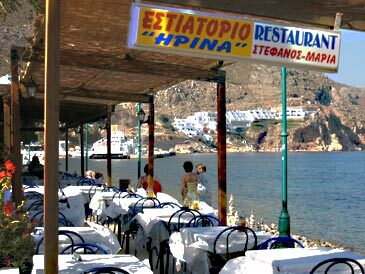 Most visitors stay in Levadia, the port and the island’s heart with maybe a dozen tavernas – you can’t get heartier than that. There is now some development, though not seriously threatening the laid-back lifestyle. 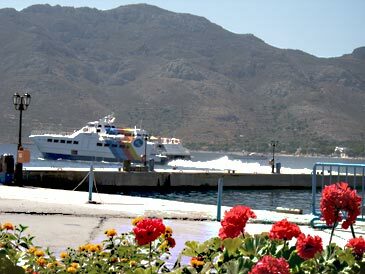 The island bus runs every hour or two across the island to Megalo Chorio (“Big Place” - well, all things are relative) and on to Eristos beach. 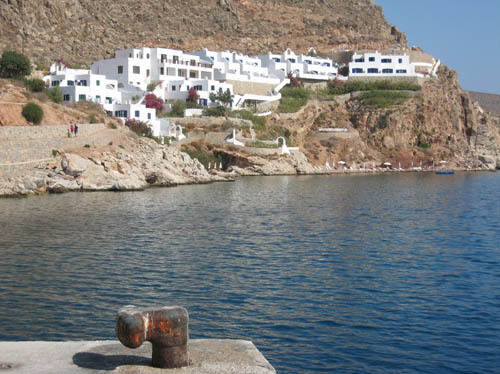 Megalo Chorio is a sleepy, picturesque village with a few shops and tavernas and lovely views down to Eristos Bay where the beach goes on for ever; its sand is good, if darkish, and this is the sheltered side of the island. The island is proud of its nature and bans hunting and shooting, making it perfect for bird-watchers. And for birds. Walking is excellent and increasingly popular. It has the added advantage of being easily combined with a day on the beach, as several walks are tracks leading to and from the beaches. There are two uninhabited villages to inspect, one non-working but still visitable monastery and some surprisingly lush and fertile areas, unlikely as that may seem at first sight. 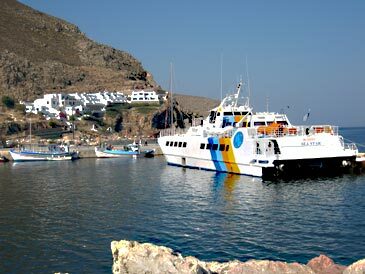 With care you might be able to use a ferry/cat for a day trip to Nisyros or possibly Halki. We get nothing but praise for this hotel, about 8 minutes' stroll along the seafront, run by two brothers, Michailis and Kostas. 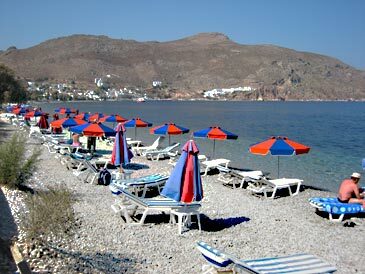 Breakfast is served on a shady terrace overlooking the beach with its sun-beds and umbrellas. The beach is pebbly shingle, but sandy shingle once you enter the sea. All rooms have sea view. Almost invisible behind its flowery barricades, the hotel is a few moments from the beach, the village centre and the bus stop. Amongst the shrubbery is a lovely swimming pool. Simple but attractive bedrooms - about half are on the first floor with sea or mountain views for which there's a small supplement. Air-con, fans, fridge, phone, hair-drier, kettle and balcony or veranda. Small supp. for rooms with better views. 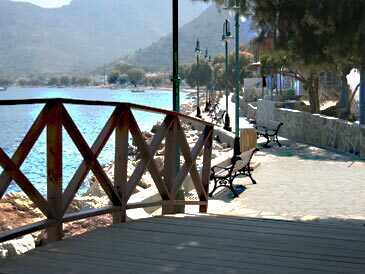 These hang to the cliff-side about three minutes from the jetty, facilitating the stunning views across the bay. 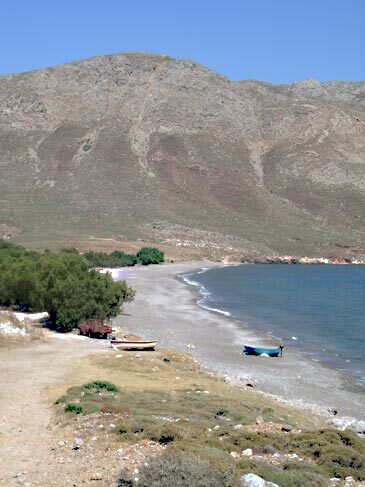 Immediately below is a small man-made beach, perfect for an early morning dip. 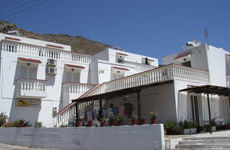 This is the sort of accommodation Tilos has not seen before, with spacious bathrooms and excellently equipped kitchens. Standards are the same in all: you pay for the extra space some units offer. Air-con, fans, balcony or terrace with sea view. S/C 2-4 pers. Some 200 metres up from the village square these spacious well-appointed studios have balconies offering a panorama over the village and out to sea. Air-con, balc with s.v. S/C 2-3 pers. Five newly built studios owned by an English couple and targeted at the walkers’ fraternity. Simple but well-appointed rooms with kitchenettes and own sh/wc. 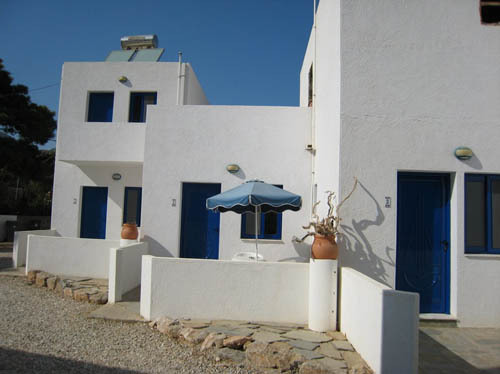 Quiet, but just a few minutes from the village centre and seconds from the beach.